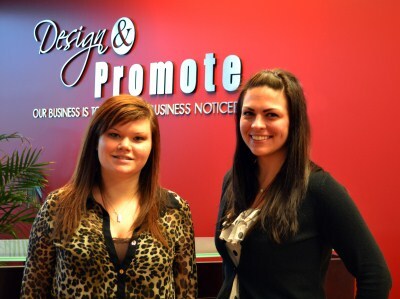 We have two new faces around the Design & Promote office! We’re pleased to announce the appointment of a new graphic designer, Danielle Luke, and a new administrative assistant, Tara Bragg. Danielle will be joining our creative team to help us craft visually stunning, SEO optimized websites for our clients. She hails from Tinley Park and has a strong background in fine art, including drawing, photography and illustration. She holds a B.F.A from Columbia College Chicago with a concentration in painting & drawing and a B.A.S from Robert Morris University with a concentration in graphic arts. Prior to joining Design & Promote, Danielle worked as a freelance designer and illustrator to assist businesses, photographers, musicians and publications in their visual branding efforts. Tara steps in to fill the newly created position of administrative assistant at our firm. She will keep us organized and also perform some of the accounting and social media duties. Tara joined the company with a great enthusiasm for graphic design, having received her graphic design certificate from Sauk Valley Community College in 2010. She hopes to further her education in graphic design and grow in the Design & Promote company. Prior to the appointment she worked as an administrative assistant at DB Marketing. She is from Aurora. We hope to see you at our office sometime to meet the two newest members of our team or to discuss your internet marketing needs. We offer effective ecommerce and internet marketing solutions that simplify your business, new or improved website design to convert customers and SEO strategies to boost your rankings in the search engines. Contact us today.